Portrayals of Women in the Old Testament: The Story of Esther The story of Esther takes place in the days of A-has-u-e'rus which reigned from India to Ethiopia, over a hundred and twenty-seven provinces. In these days A-has-u-e'rus sat on the throne of his kingdom in the palace of Shu'shan. In the third year of his reign he had a feast for all of his princes and his servants. During this feast, he "shewed the riches of his glorious kingdom and the honour of his majesty many days, even an hundred and fourscore days" (Ester1:4). After those days were over, the king had a feast for all the people great and small, who were present in the palace, seven days in the court of the king's palace. The people were served royal wine in gold glasses and served to the people in abundance according to the state of the king. The drinking was according to law, no one forced, because the king told all offices of his house to do as they pleasured (Esther1:9). Vash'ti the queen, wife Hurt 2 to A-has-u-e'rus, had a feast for the women in the royal house which belonged to the king. On the seventh day the king A-has-u-e'rus commanded the presence of his seven chamberlains. He commanded them to bring his wife queen Vash'ti with the crown royal , to show off her beauty. Vash'ti was said to be quite beautiful, appealing to all. Queen Vash'ti refused to go to the king. The king was enraged and took counsel among his wise men, to try to figure out what he could do under law to punish Vash'ti for her insubordination to the king. Me-mu'can one of the princes of Persia and Media says, "Vash'ti the queen hath not done wrong to the king only, but also to all the princes, and to all the people that are in all the provinces of the King A-has-u-e'rus" (Esther1:16). The queen's punishment was that Vash'ti may not enter into the royal presence. Four years, later the king decides to take another queen. The royal minister searched for the most beautiful virgin women in the king's palace. It was decided that which ever woman appealed to the king the most would be queen, rather than Vash'ti. Of the women chosen to be presented to the king for consideration was a young Jewish woman, living in Shu'shan. This woman was Hadassah, that is Esther, she had been Hurt 3 raised by Mor'de-cai, of the house of Saul. Esther was very beautiful so she was put in the custody of He'ge, "keeper of the women." 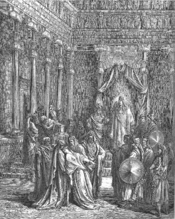 There were many women brought to the royal court because of the decree of the king. When it came to be Esther's turn to appear before the king, he instantly fell in love with her beauty and made her queen in the place of Vash'ti, by placing the crown upon her head. Esther did not tell the king of her people or of her family and relation to Mor'de-cai, even after they were married, because she had been advised against it by Mor'de-cai. In days to follow, Mor'de-cai found out that Big'than and Te'resh were conspiring to harm the king. He told Esther who told the king and the two were hung on a tree. The matter was written in the book of the chronicles, in the presence of the king. Then for some reason not indicated the king promoted Ha'man an A'gag-ite "above all the princes that were with him" (Esther3:1). By the royal command he was honored by all the kings servants, except Mor'de-cai, who refused to bow before him. This angered Ha'man, after which he was determined to destroy the Jews in the kingdom, as punishment for Mor'de-cai's actions. In the first month (Ni'san) of the twelfth year of the kings reign, Ha'man tells the king that there are people Hurt 4 across the kings land who do not follow the kings law. He tells the king that their laws are different from all others, and because they do not obey the law of the king then he should not hesitate to make them suffer. The request of Ha'man, that all Jews in the kingdom be destroyed was granted and a decree of the king was put forth. When Mor'de-cai heard of this decadence he was mortified, and grieved deeply for the future of his people. When Esther heard of his sadness she instantly was curious of the source of his pain. He then sent messengers to tell her what happened and advises her to standup for her people. At first, Esther states the law that she is unable to go into the king's court unless invited because it is punishable by death. Then Mor'de-cai tells her not to think of her self but rather her people, because she is more likely to escape this punishment than an average Jew. Then she excepts the duty, goes to the king and he excepts her uninvited presence and asks what is her request. Esther then invites the king and Ha'man to a banquet, Ha'man acts as though he opposes. The king then orders him to do as the queen says. At the banquet the king asks Esther to make her Hurt 5 request and she asks him to come to another banquet the next day accompanied by Ha'man. Ha'man went home and bragged to his wife Ze'resh and friends, about the honors from the queen, his position, and his wealth. However, none of these things meant anything to him because Mor'de-cai "the Jew" still sat at the king's gate, he hated this because Mor'de-cai refused to bow down before him (Esther5:14). His wife and friends advised him to have a gallows made to hang Mor'de-cai on, and talk to the king about it. On the same night the king couldn't sleep, so he commanded that the book of records be reread to him. During which he recalled the time that Mor'de-cai had told on the conspirators and saved his life. The king was reminded that he never gave a reward to him, so he ordered Ha'man to honor him in royal fashion. The next day at the banquet the king asked again what was the queen's request and she told him. She said that there was a man who wished to destroy her people, the king asked who the man was and Esther told him that it was Ha'man. The king ordered Ha'man to be hung, on the same gallows, he'd prepared to hang Mor'de-cai on. At Esther's request the decree punishing the Jews was reversed, and they were given permission to punish their enemies. This Hurt 6 was granted because, "Ha'man had devised against the Jews and cast Pur, that is, the lot, to consume them and destroy them" (9:24). Esther also requested that the ten sons of Ha'man be hung and it was done. Her people were freed of the decree that would destroy them and Esther made requests that would ensure, no vengeance would be sought against her people. The story of Esther, portrays a strong woman, yet there are hints of segregation, passiveness among women, and the ideal that women must be purified. The reader can see a hint of segregation of women from men in the beginning of the book of Esther. The women and men have separate feasts (1:9). The kings belongings are seen as only his and not shared by the queen. An example of this would be, "Vash'ti the queen made a feast for the women in the royal house which belonged to the king A-has-u-e'rus" (Esther1:9). It is as if they are saying they are married and live there together but the house is his. She throws a feast for the women in his house. Then, in Esther 1:12-15, there is the notion that if a woman does not want to be put on display, she should be punished. When the ministers search for another queen they search for the fairest virgin. This Hurt 7 is another emphasis we see being put on virginity and the need for purity. When Esther became queen she did not show who her people were because her uncle advised her against it. "Esther had not showed her people nor her kindred: for Mor'de-cai had charged her that she should not show it" (2:10). Esther could be said to be passive in this part of the story because she just does what she is told with no questions. This could be used to make women submissive. An example would be Esther 2:20, " Esther had not yet showed her kindred nor her people; as Mor'de-cai had charged her: for Esther did the commandment of Mor'de-cai, like as when she was brought up." Then later after the Jews in the kingdom are sentenced to perish, Mor'de-cai advises Esther to standup for her people by approaching the king (4:8). The fate of the Jewish people in the kingdom is put into her hands. She advises Mor'de-cai to gather all the Jews and fast, then she says "If I perish, I perish" (4:16). She is a strong woman she knows that she may die trying to save her people but thinks nothing of it. Esther excepts the responsibility of saving her people. In this part of the story she is portrayed as powerful because she holds the fate of many in her hands. Esther can also be Hurt 8 seen as powerful, in the respect that, she requested her people be spared and Ha'man be punished instead and it was done. The king fulfilled her request with no questions asked no type of hesitation. In Esther (2:12), we see the ideal that women are in need of purification, like they are dirty or unclean. "There was originally a non-Jewish element in the story of Esther, shown by the use of the word Pur. Pur, which is translated into Hebrew by Goral "lot" and the word itself, is Hebraized by adding the plural termination -im to it. This became henceforth the name of a Jewish feast, which has been celebrated annually ever since as Purim" (Osterley134). This is the celebration, two days of remembering a time they almost perished and why they didn't. Owing doubtless to its very secular character, there were strong protests against Esther being included in the Canon (Osterley137). The only reason it was included was because it somewhat explained the feast of Purim, even so it wasn't secured until around 120 A.D.. Esther gives us a picture of the Jews in exile, of the hostility of their non-Jewish enemies in Persia, and how Esther became the queen of Hurt 9 Ahasuerus. Subsequently risking her life in order to save her people from total destruction. Gods providential care of his people is magnified throughout the story, reflected through the ways in which Esther handled the situation. Instead of allowing the people go into a state of chaos, she tells Mor'de-cai to gather the people and fast. So we can see that Esther is a religious women with faith. However, it is interesting to know that the word God, never appears in the book of Esther. In the book of Esther women aren't really portrayed negatively. The treatment of Vash'ti could be seen as disrespectful to women. It is unfair that she was tossed aside because she did not want to be showed off to company. It is negative that Vash'ti was punished because of this and it sends the message that women are to be shown off like trophies. But the book of Esther doesn't really help to set any stereotypes of women or gender-biased roles. Some sections where it speaks of Esther doing as Mor'de-cai tells her could be used negatively. The underlying meaning of her not saying anything is to help her not to hurt her. Mor'de-cai is looking out for her best interest, Jews were a really oppressed people during this time. Mor'de-cai may have been trying to spare her from this type of life. I Hurt 10 believe that he told her not to speak about who she was, who her people were, to help her not to make her submissive. That's why he came by the palace each day to see how she was. There is an example of this shown, " And Mor'de-cai walked everyday before the court of the women's house, to know how Ester did, and what should become of her" (Esther2:11). I think this book, might be one of the rare parts of the bible where women aren't portrayed as the whore, the concubine or the temptress. The women in this story are complimented on their beauty but it never goes into description about their education or skills they possess. A good thing about the portrayal of women, in the book of Esther, is most of the women are mentioned by name and not just who they are married to. The punishment of Vashti was very much unfair but the overall picture of woman, is seen through the portrayal of Esther. Esther is seen as a strong and able woman who saves not only herself but her people as well with no help from anyone. WriteWork contributors. "Portrayals Of Women In The Old Testament" WriteWork.com. WriteWork.com, 01 February, 2008. Web. 22 Apr. 2019.